Each of 18 ethnic minorities in Romania is granted one seat in the Chamber of Deputies. 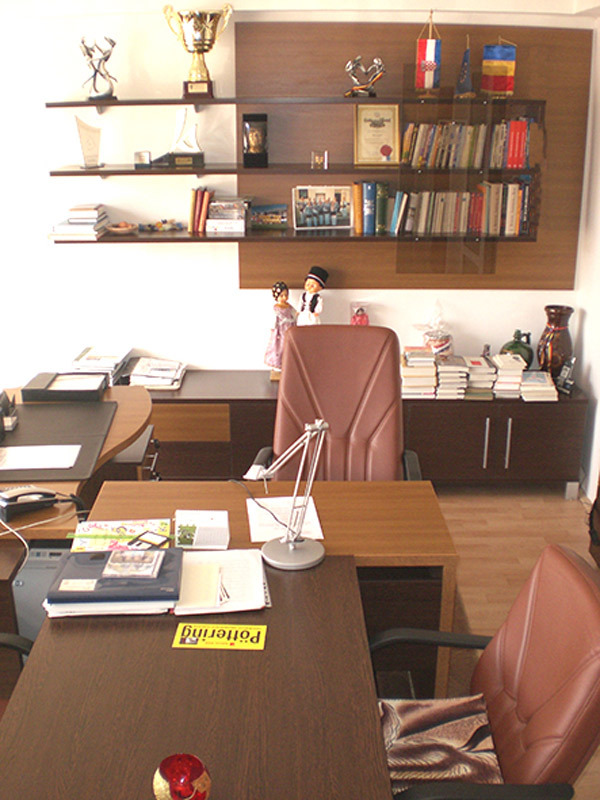 All of them have some sort of political party or rather cultural organization, that has a party symbol [http://www.cdep.ro/pls/parlam/structura.gp?idg=7]. I don't have much information on the flag use, though. Most of them probably use the national flag of their "motherland" to some degree. This might apply to the Bulgarians, Italians, Slovaks and Czechs, Greeks, Jews [see note 1], Albanians, Turks, Armenians, Croatians, Poles, Serbs, Macedonians and Ukrainians. I do not know if Germans in Romania use the German national flag to some extent. Transylvanian Swabians (one part of the ethnic Germans in Romania) do use their colours blue-red [www.biertan.home.ro], that are also used in the flag of their refugee organization in Germany. The Roma might use the Roma flag. I don't know which flag the Ruthenians, Tatars and Lipovan Russians would use to denote their ethnic background. The Albanian minority is represented by the ALAR (Asociaţia Liga Albanezilor din România = Association League of Albanians of Romania). ALAR has been founded on 30 June 1999 and has been holding one seat in the Chamber of Deputies continuously since 2000 (the precursor organisation UCAR 1996-2000). The symbol1 2 3 is very simple: a white circle inscribed in a white triangle, all outlined black, in the center the party abbreviation "ALAR". I have not found any flag usage, neither of a particular party flag nor of the Albanian flag (the latter surprising me). However, the homepage shows a scroll cleverly combining the Romanian colours with the Albanian ones1. The Armenian minority is represented by the UAR (Uniunea Armenilor din România = Union of Armenians of Romania). The symbol1 2 3 is a rather complicated line drawing, showing the interior of an Armenian church, an eagle displayed, and at the bottom the party abbreviation U.A.R. I have not found any particular party flag nor any other flag usage. a) The seal of the UCR is circular. 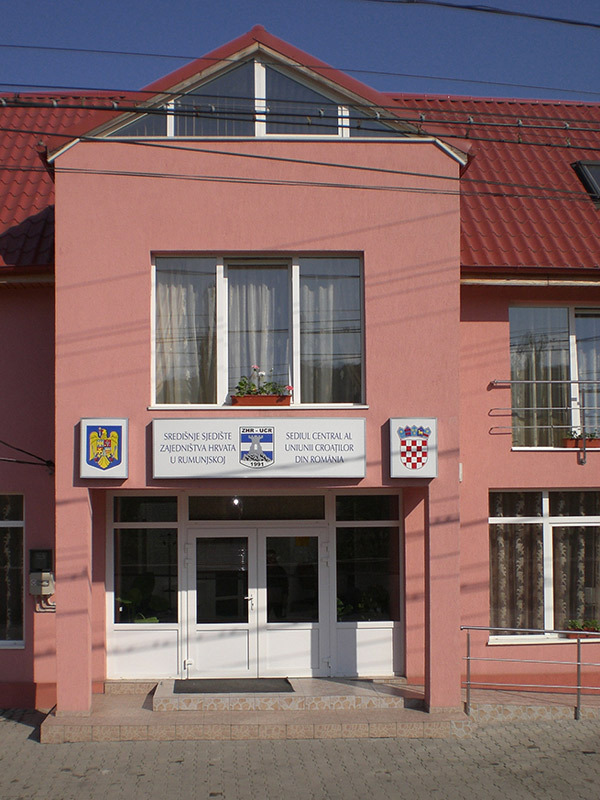 The outer text is in Croation language "Zajedništvo Hrvata u Rumunjskoj", the inner text is in Romanian language "Uniunea Croaţilor din România", and in the center there is the emblem of the UCR. The symbol for elections is totally different4 5: It shows a Latin cross bottony with the inscriptions Croaţi (above) and Hrvati (beneath). The only flag that I have found in use is the Croatian national flag6. 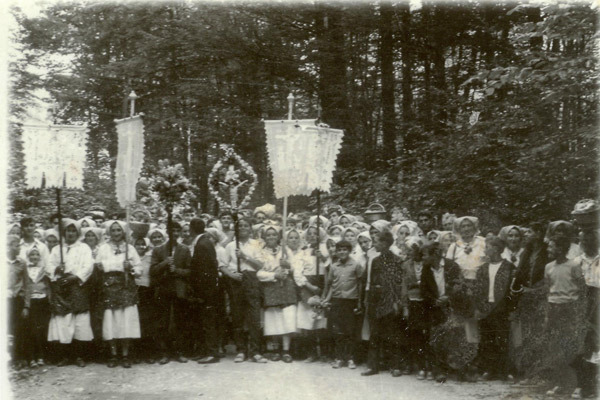 Furthermore, a historical photograph shows several church banners7. The minority of Greeks is represented by the UER (Uniunea Elenă din România = Greek Union in Romania). The UER has been founded on 28 December 19891 and has been holding one seat in the Chamber of Deputies continuously since 1990. (4) The official seal of the Union includes the symbol of the Union and the name of the Union in Romanian and Greek language." As far as I can see, the symbol of the UER is not used on flags. The flag used by the UER in cultural and political context is the Greek national flag4 5 6 7 8. Association of Italians of Romania (Asociaţia Italienilor din România), abbreviated RO.AS.IT. This is the representation of the Italians in Romania, and it has one reserved seat in the Chamber of Deputies (as the other 17 minorities' organizations). The symbol of the Association of Italians of Romania - RO.AS.IT. has significant Latin influences in a European historical and cultural context, with a graphical element that represents "The Capitoline Wolf", the she-wolf with the two siblings Romulus and Remus, inscribed in two concentrical circles, one of them dotted externally, the field between the two circles of blue colour, on which there are 10 stars of yellow colour. In the interior of the two circles there is the graphical element of the she-wolf with the two siblings Romulus and Remus, over which it is written and underlined semicircle "Asociaţia Italienilor din România", whereas under it the abbreviation RO.AS.IT. The graphical symbol is registered at the Patent and Trademark Office (O.S.I.M. ), deposited under no. 040574 constituted on 20 August 1996, published in the Official Gazette for Industrial Properties, Section Trademarks, no. 6/1998, later on modified conforming to the decision of the O.S.I.M. no. 559109 of 23 June 2008 and republished in the Official Gazette for Industrial Properties, Section Trademarks, no. 4/2008." I am not sure if the symbol is also used on flags. I have found one photograph4, that implies the usage of the symbol on white background. However, these seem to be small or large paper sheets only, and not flags. Nevertheless, I have made a gif of a presumptive flag. The minority of Lipovan Russians (Russian Old Believers) is represented by the CRLR (Comunitatea Ruşilor Lipoveni din România = Community of Lipovan Russians in Romania). The CRLR has been founded on 14 January 19901 2 and has been holding one seat in the Chamber of Deputies continuously since 1990. The symbol of the CRLR has changed a little over time1 3 4 8, the main elements are the boat on the water. The symbol of the Community is the boat on water, a seagull in flight and a sunrise in a circle; the symbol for elections is the boat on water in a circle." Images can be found at4 5 6 7. The symbol is not only used for the elections, but also prominently displayed on the CRLR journal "Zorile"8. I have not found any particular party or organizational flag. Even the Russian flag seems to be used only for special occasions like celebrating the victory in WWII9. On the other hand some flags were used during festivities in 2000: the photograph is not really clear, though1. 1. Moldovan, S (2004) Comunitatea Ruşilor Lipoveni, Bucharest (Ararat). The Partida Romilor Pro Europa (Party of the Roma for Europe) is the representation of the Roma, and it has one reserved seat in the Chamber of Deputies (as the other 17 minorities' organizations). Originally, the party was known as Social Democratic Roma Party (Partida Romilor Social-Democrată), changed its name into Partida Romilor later, and now the name is Partida Romilor Pro Europa. "The symbol of the associaition "Party of the Roma For Europe" is a trefoil with three leaves". For the flag, I have found a few images of table flags2 3. These are white, show the party symbol (the trefoil) in black over the (old) party abbreviation PRSD in blue, all in a black rectangular outline. It is probable that newer flags would be similar, but with the updated party abbreviation "PR". I had reported about another flag, namely the Romanian flag with the party symbol in the central stripe. I have not found additional information on this one. I have not found many true political flags of the political/cultural organizations. Only for the PRSDR (Roma Party) there is some hint that they might use the Romanian flag charged with the party symbol. It is not improbable, though, that this is just a one-off makeshift flag. The Ruthenian minority is represented by the UCRR (Uniunea Culturală a Rutenilor din România = Cultural Union of Ruthenians of Romania), holding one seat in the Chamber of Deputies continuously since 2000. The symbol1 2 3 is the one used nowadays by the Transcarpathian Oblast of Ukraine, but used before as coat-of-arms of Karpats'ka Ukraine. It can be blazoned as follows: Per pale, dexter barry of eight Azure and Or, sinister Argent, a bear rampant Gules. The flag is the one used by other Ruthenian communities in the world, namely a blue-white-red (2:1:1) horizontal tricolour with the arms in the center. It is used in a horizontal version4 5, a hanging version6 and a table banner version7. 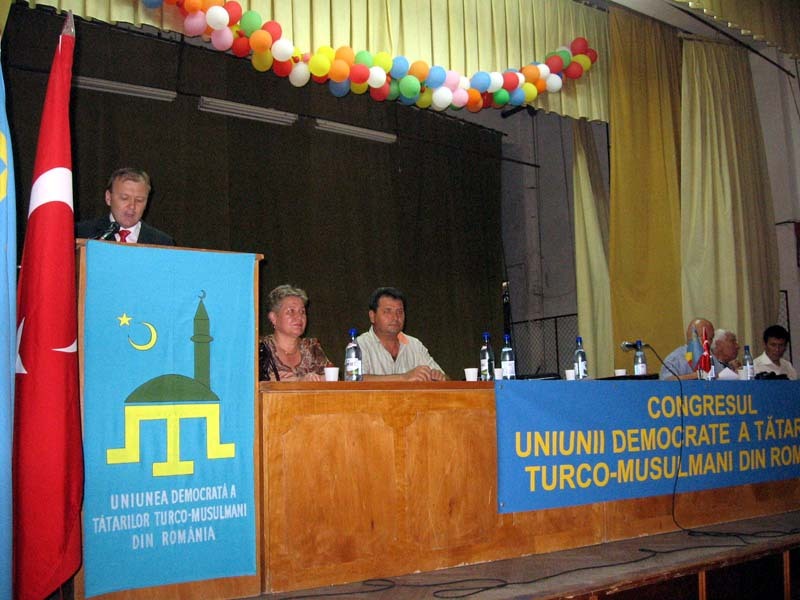 The Tatar minority is represented by the UDTTMR (Uniunea Democrată a Tătarilor Turco-Musulmani din România = Democratic Union of Turco-Islamic Tatars of Romania). The symbol of the UDTTMR1 2 3 is a clever combination of the Tatar tarak3 as a basis for a mosque, with crescent and star (the mosque being green, everything else being yellow). I have not found any particular party or organizational flag of the UDTTMR. However, they are using the Crimean Tatar flag together with the Turkish national flag3 4. The Turkish minority is represented by the UDTR (Uniunea Democrată Turcă din România / Romanya Demokrat Türk Birliğin = Turkish Democratic Union of Romania). "As emblem, the Turkish Democratic Union of Romania has a globe on which there is the symbol of the Turkish ethnic group (crescent and star), being surrounded in bottom by two olive branches, symbolizing peace. At the base of the globe there is the name of the Turkish Democratic Union of Romania, surrounded by the Romanian tricolour, representing the support the Romanian state gives to the Turkish ethnic group for the preservation of the spiritual-cultural- religious identity." The colours of the symbol are as follows: the globe is red, crescent and star are white, the branches are green; the field with the party name is white, the name itself blue; the base surrounding this field is (from outside) blue-yellow- red. The UDTR is obviously using a flag: the party symbol on a white background4. The Ukrainian minority is represented by the UUR (Uniunea Ucrainenilor din România = Union of Ukrainians of Romania), holding one seat in the Chamber of Deputies continuously since 1990. The symbol1 2 3 shows a torch, surmounted by an open book, on the center of the book the Cyrillic letters "СУР" ("SUR"), the party abbreviation in Ukrainian.